You're out in public and everything is going great ... until your child goes into full-on meltdown mode. You're embarrassed, frustrated and wishing you had stayed home. How you deal with your child's public meltdowns will not only help you manage today's meltdown with less stress but will also set the stage for how your child handles her feelings in public in the future. Only you know your child so try some or all of these strategies to keep the peace in public. You've been shopping for two hours and your four year old has had enough. You can see the meltdown coming in 3, 2, 1. Blast off! You may be horrified at her behavior but don't be dismissive. Address your child's feelings without trying to shut her down. Acknowledge that you've been shopping for a while and you know she wants to go home to play with her toys. Tell her you're trying to finish up so you can get home but you need her to stop crying so you can. It's common to want our kids to hush so much because of our embarrassment that we gloss over our kids' feelings. But addressing those emotions and teaching her how to deal with her feelings not only helps her, it ultimately helps you too. Sometimes our kids get so overwhelmed in the heat of the moment that they simply don't know how to calm themselves down. Redirecting your child can be a lifesaver when you think that public meltdown is never going to end. Instead of feeling like you're practically begging her to stop crying to no avail, try to redirect her to pull her out of the "world is ending" mindset. Sometimes redirecting to another activity can stop the meltdown in its tracks. For example, "Let's get those tears wiped up and you can help me pick out some wrapping paper for your grandmother's present." It's tempting to bribe your way out of a public meltdown but do try to avoid the bribe. What a child typically learns from the being bribed is that her meltdown gets her something good. So while you save yourself now, you end up setting yourself up for the next meltdown when your child expects you to offer up something to stop her screaming. However, you're not failing as a parent if you do offer up a bribe. Sometimes you just have to do what you have to do. Avoid the bribe if possible but assess the situation and decide for yourself if you want to offer a bribe to tame the tantrum. Your child is screaming and you want to scream out of both frustration and just to be heard. Of course, no amount of a grown-up screaming is going to help the situation. Keep your calm during the meltdown. Follow the discipline rules you've outlined at home and your child is used to. Simply tune out the passersby gawking at your child sprawled out on the floor. Look past your child's over-the-top emotions and out-of-control reaction. Count to 10. Take a deep breath. Do whatever it is you do to keep your calm and keep that parenting frustration under control, not because you're in public but simply for your child's sake. The more calm you are, the quicker she'll come out of the meltdown and the better she'll learn to handle her own emotions by modeling your behavior through the stressful situation. Your child has just emptied the store shelf of all the candy bars to show her outrage that you won't buy her one. You could give her a candy bar and instantly stop this meltdown but, like the bribe, what do you think will happen the next time you're out in public and your child wants something? Some parenting battles you simply don't have to win. Others are worth standing up for so you don't lose all control every time you go out in public. When dealing with your child's public meltdowns, don't give in to her demands, no matter how much you want that screaming to stop. If you have to take her out of the store to get her to get herself back under control, then leave your shopping cart behind and go. You don't want her to learn that her knee-jerk reaction is the way to manipulate you. If you're a parent, you've been there. You've seen the stares, maybe even heard the comments, felt others judging you as a mom and you feel like you're the only one who's ever had a child act this way in public. You're not. We love our kids and they're wonderful. But they're also unpredictable, sometimes frustrating and even quick to embarrass us when we're in public and they see our desperation to get them to snap out of that meltdown. You're not alone and everyone who's been called mom or dad has had a child go in freak out mode when out in public. And for those who don't have children or have conveniently forgotten that their own children pulled the same kind of stunts in public, just remember, they were kids once and did the same things to their parents too! 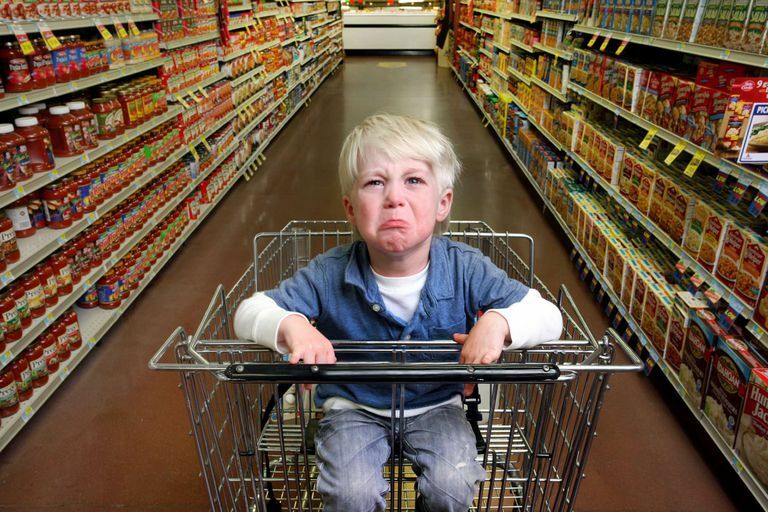 It always seems your child's meltdowns occur in the middle of the store where everyone is trying to shop. Instead of just having to deal with your child's public meltdowns, which can be difficult enough, she has chosen a spot that seems to be center stage. While it's hard to convince your child to get up and have her meltdown over there out of the way, try to do just that. Dealing with a meltdown is stressful on you and even on your child. An audience just heightens that stress to another level neither of you need. Help her off the ground, guide her away from the store's traffic, do whatever you can to get her somewhere more private in the store, which can relieve that tension and anxiety you both are feeling from being on display in the middle of the store. Without the audience, it will also be easier for you to get her to listen to you so you can put the meltdown behind both of you. Any time your child has a meltdown, take some time to relive it. This will help you identify the trigger that caused the meltdown so you can avoid it or at least prep your child to get through it next time. You can't always predict what will send your child's emotions unto overdrive. But you can strategize ahead of time so you're better prepared when the next meltdown happens while you're out in public.